I flew on an airplane today. A woman sat to my left in a two person aisle. She was about 45 years old. Her husband sat a few rows ahead and her two teenage children sat in the row behind us. 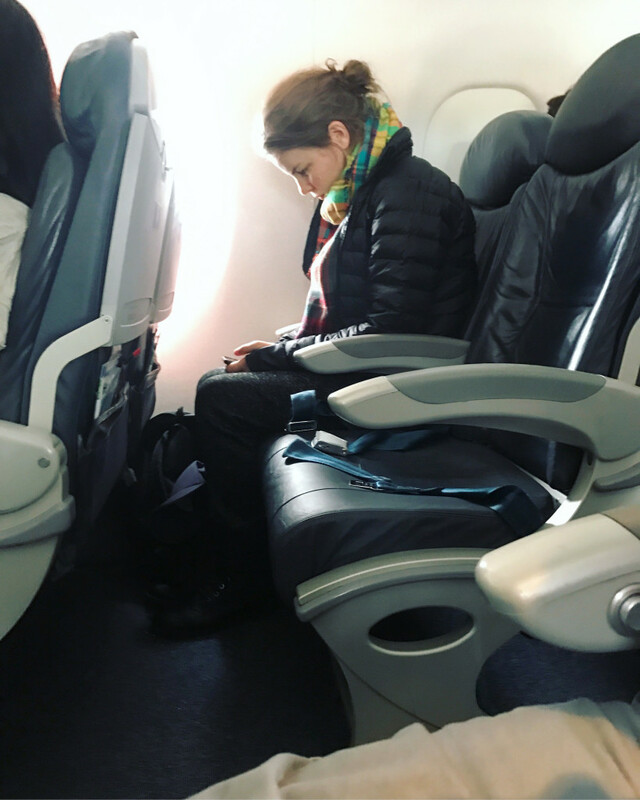 Half hour into the flight, the woman’s husband walked over and told her there was an empty seat by him. She stood up, grabbed her bag, and walked down the aisle. I put my jacket on the empty seat and spent the flight writing in my journal. I looked on the floor and saw papers. I picked them up. The papers were printouts of the family’s flight information. The woman’s name was something like Julianne Rutherford. They were flying to Newark with a connecting to a flight to San Francisco. Text was highlighted in green. I put the papers on the chair. Twenty minutes later a male flight attendant walked up the aisle holding a garbage bag — asking for garbage. He passed my row. I handed him a plastic cup. I picked up the papers, folded them, and threw them in the trash. I’m not sure why I threw the papers in the trash. “We are now starting our descent into Newark,” the captain said over the speaker. I looked toward the front of the plane. The woman who had been sitting next to me — now sitting five rows ahead and across the aisle — was searching through her bag. The teenage girl looked under the seat. I looked toward the ground. I knew she would not find the boarding passes. “We have ten minutes to make our connecting flight. I don’t want to miss it,” the boy behind me said. The girl got up. She sat next to me and started looking through the pocket on the back of the seat. I had to say something. I didn’t want to. Maybe if I spoke up though, we could talk to the flight attendant and arrange a garbage bag search. I had questions like, How many garbage bags were there? How would we know which bag to search through first? Would I be the one doing the searching? The way she responded, reminded me of how I would respond if I was a teenager. Brushing it off because she didn’t want to make a big deal. She stood up and walked back to her seat. “Mom I sent you something,” I heard her say to her mother, down the aisle. “She probably sent her mother a text saying I threw them out,” I thought in my head. I wondered how she referred to me in the text. Did she say, “This lady threw out the passes. or This woman…This girl. I was curious. I looked out the window. Then peeked over the head rest, looking at the Mother. She was looking forward. The family ran off the plane to catch their connecting flight.